Here is hoping your new year is getting off to a great start. 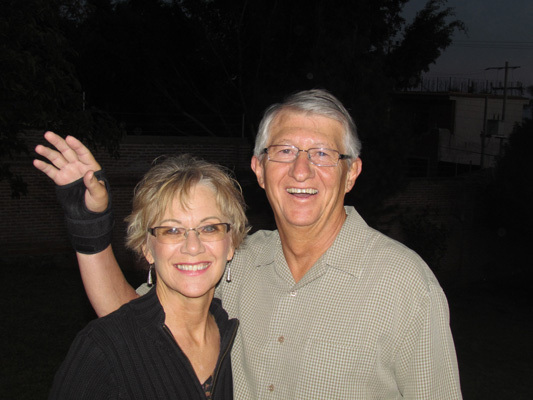 As you can see, Larry progressed from a cast to a splint. He still can't golf or bike, but that is not stopping us from getting the most out of our experience here in Ajijic. Keep us informed by clicking on the email link Larry and Glorine. Current temperature and time in Ajijic. A fun tradition and a major fundraiser for Red Cross is the annual "polar bear plunge" which occurs on New Year's day. 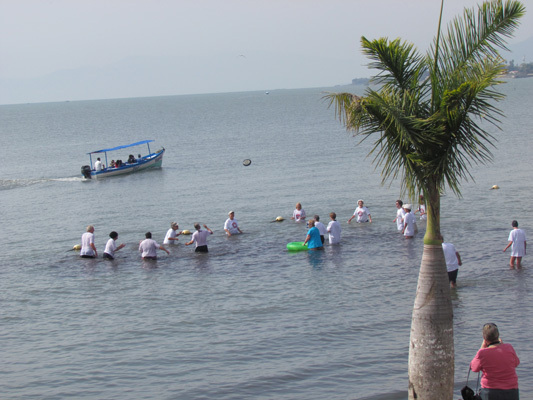 Brother-in-law Wayne used to do this in New York but much rather prefers doing it here in Lake Chapala. After the plunge, we met up with this young man, who we met at the New Year's Eve party. 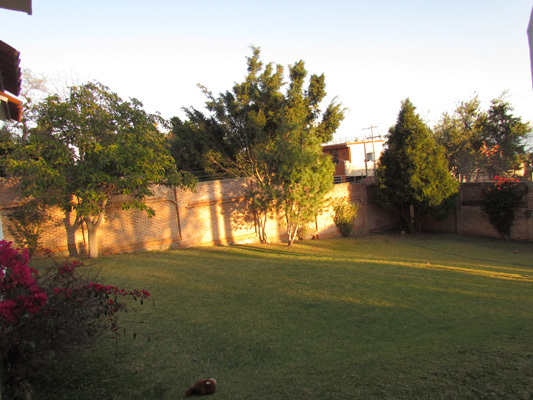 The young man lives with his mother in Guadalajara, but was staying in Chapala with his aunt over the weekend. 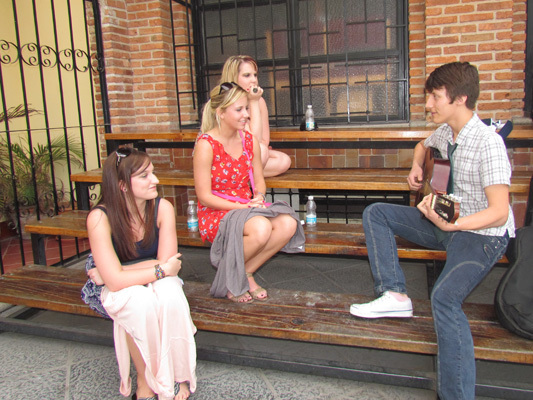 Here he is serenading the girls--he was a sweet kid. Later we walked along the malecon to show the girls the sights of the town of Chapala and ran into this little guy. He was a part of a three-piece band entertaining the crowd. No doubt, he stole the show. 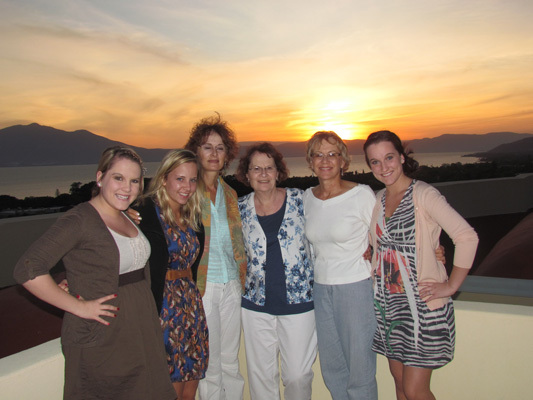 One day we took the girls on a home tour of both traditional Mexican and some very contemporary homes. 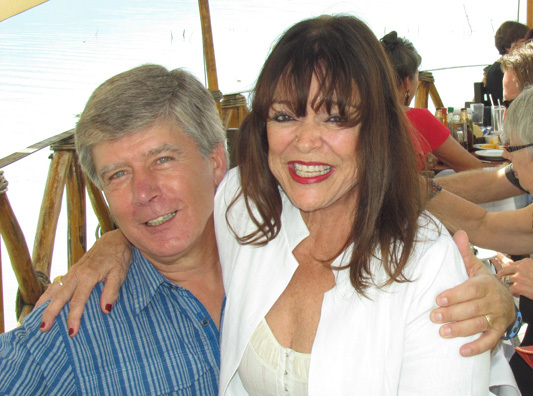 Here is Ross and Coral, new friends we met on the bus tour to Zacacecas back in November. They were gracious enough to host a dinner party at their beautiful condo. 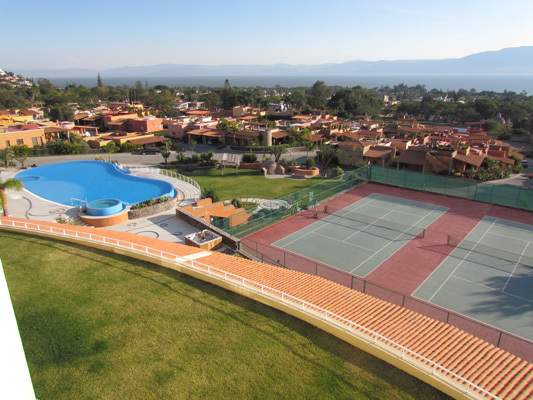 We all fell in love with it, both the interior but especially the balcony with views of Lake Chapala and the mountains. Here are but a few of the many amenities offered to these snowbirds. In the summer they live in another paradise, north of Vancouver, BC. 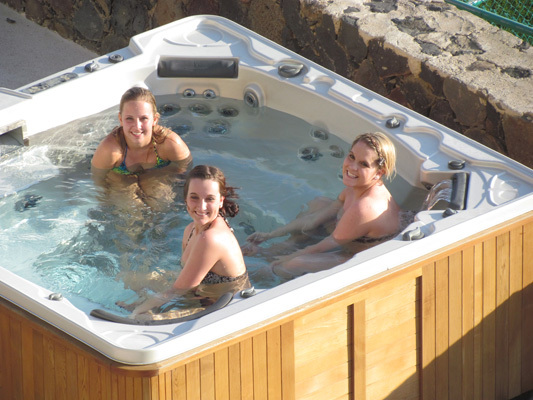 Here Larry is taking advantage of his new camera with its zoom lens and took a close up of the girls enjoying themselves in one of two hot tubs. We caught this beautiful sunset as Marlene and her three beautiful granddaughters were winding down their week-long vacation here in Ajijic with sisters Glorine and Maureen. It was exciting for them and for us to show them the little slice of heaven we live in. 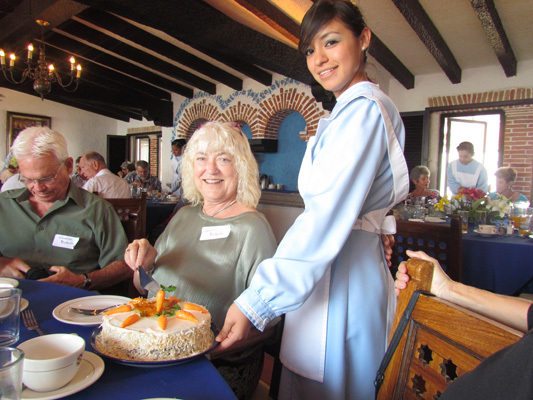 Another weekly tradition we partake in is Open Circle held at the Lake Chapala Society. Each week, speakers come in and share stories, information on a wide range of topics. Here Barbara is sharing her experience and lifelong passion in Astronomy. As we do, many of our friends enjoy introducing family members to their extended family of friends that make up the culture of Ajijic. 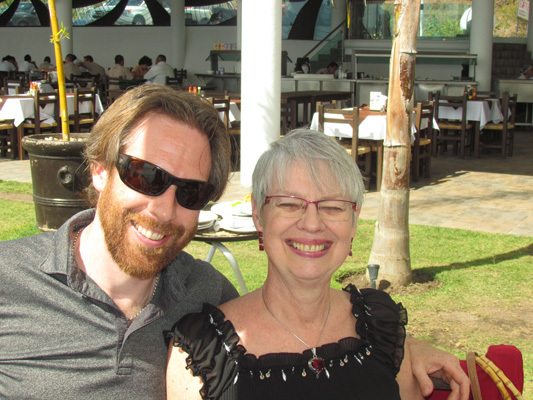 Here Marilyn is pictured with son Brett, a world traveler currently living in Japan. 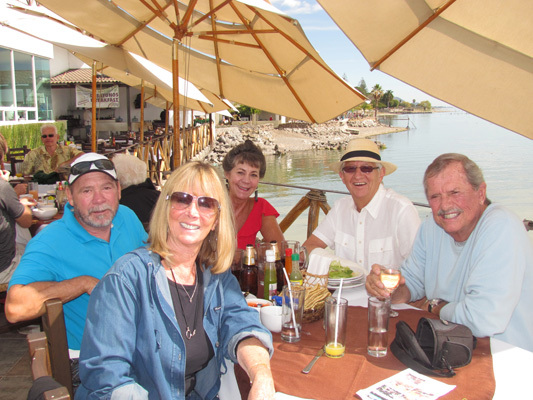 Thanks to Marilyn, this get together was another opportunity for us to enjoy each other's company along with some fine food, here at a restaurant on the shores of Lake Chapala. Another Sunday, another Open Circle and another wonderful get together with friends. Here we on a new roof-top cafe in downtown Ajijic that had a great buffet, plus made to order omelets, eggs benedict and waffles. Hmmmmmmmm! El Senor del Monte's festival (The Festival of the Mount) is a nine-day festival held in the city of Jocotepec, the western most city on Lake Chapala. 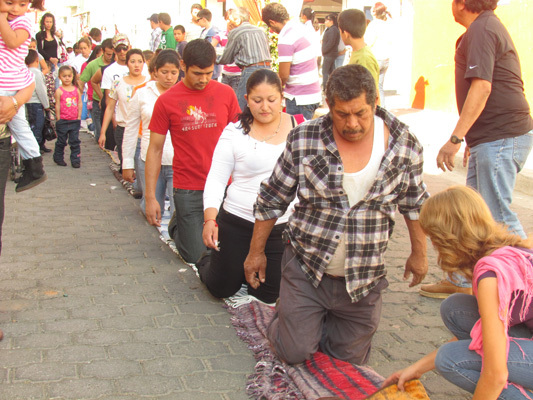 Here many Mexicans do a pilgrimage by either crawling on their knees or walking blind folded through the streets of Jocotepec to the church. 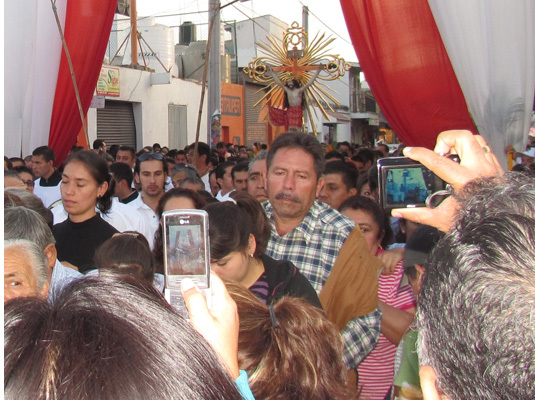 With a population of just under 40,000, Jocotepec swells to over 100,000 for the festival. Here the procession of the cross winds around the city, where it is placed on the alter in the plaza where Mass is then held. Like America and Canada, people lived here prior to Columbus. 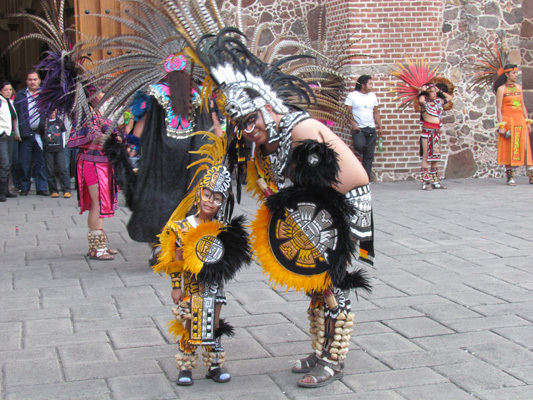 Here are local Mexicans dressed in the customs of indigenous tribes "Aztecs" and dancing to the beat of the drum. This little guy was having fun with his dad. There can't be a festival without a mariachi band. 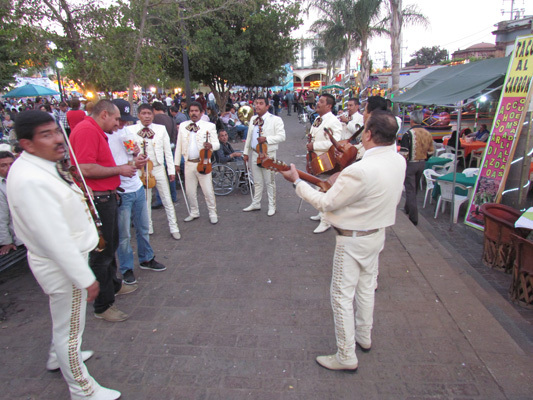 Mariachi music started in the state of Jalisco back in the 1860s. The band consisted of violins, trumpets, a classical guitar, and a large acoustic bass guitar. The musicians are all dressed in the same outfits normally with wide-brimmed hats. Here we are with Brian and Marilyn enjoying the mariachi music and waiting for our order of tacos to arrive. 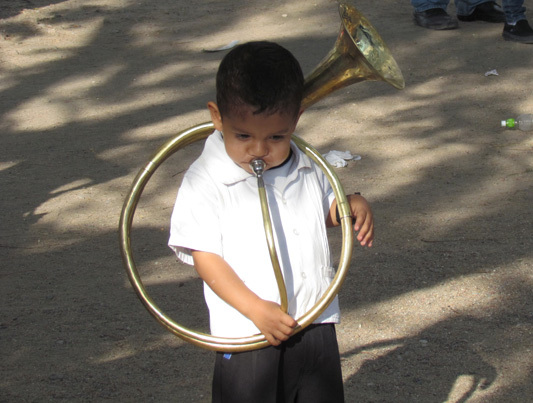 The sights and sounds of festivals like this make living in Mexico such a treat. One last stop for the evening is a bar known as Salvador's. 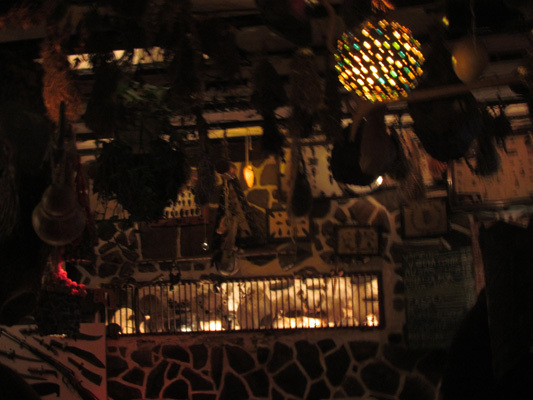 It is very dark inside and the bar is made up of rocks from the mountains north of Jocotepec. It is rarely opened and when it is, the only indicator is a single light bulb lit near the door. It is famous for a drink called Fresca, which is crushed limes and lemons, a couple of shots of tequila, ice, and topped off with Squirt or Fresca. Hmmmm! 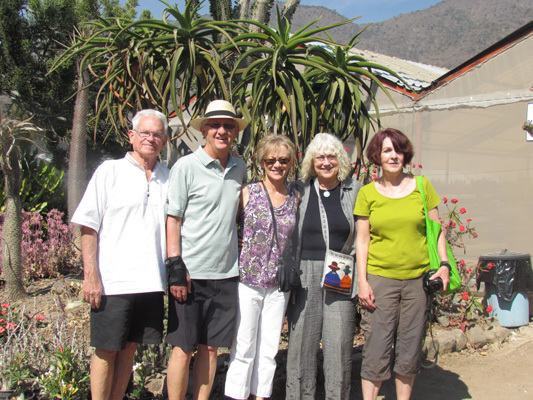 ++++ In addition to a lot of house tours, we enjoy partaking in the garden tours, put on by the Lake Chapala Garden Club. Here, couples open their homes for people to walk through and see the beautiful plants, fountains, statues, outdoor sitting areas, covered patios, etc. 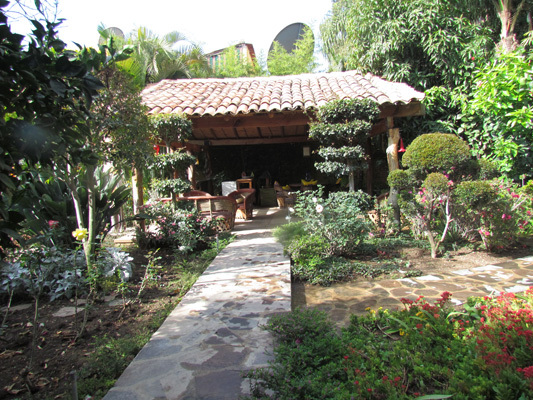 This homes' specialty were cactus plants and flowering plant. This plant caught our eye because of its unique shape and color. 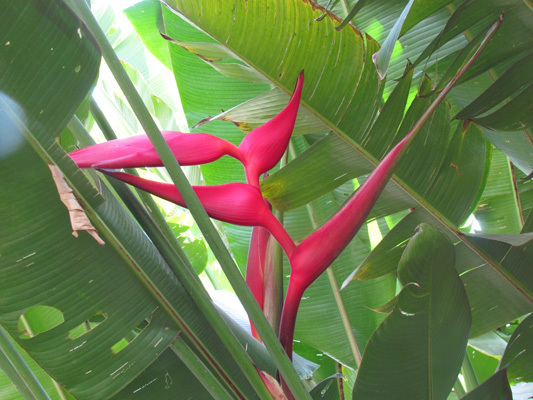 It looks much like a Bird of Paradise, but is a part of a wide leaf tree. Just gorgeous. 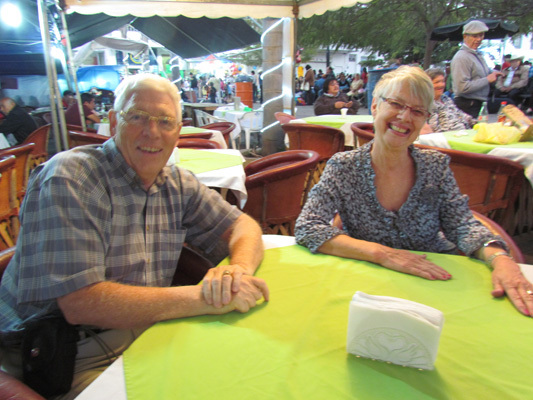 Chuck and Jean are members of the Lake Chapala Garden Club. We and friend Sueki (from Santa Rosa) joined them on the tour. 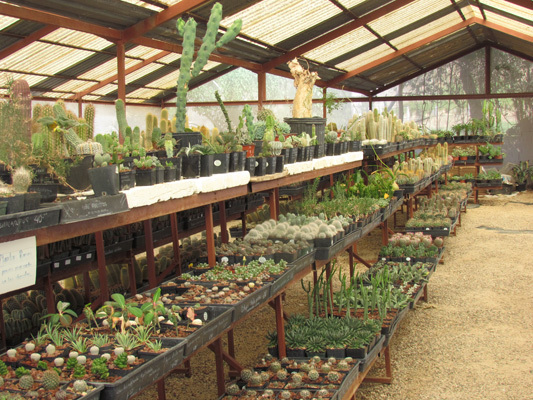 All the cactus we saw on the garden tour got us interested in cactus, so we stopped by a nursery that specializes in cactus. They had several greenhouses filled with every variety imaginable, plus lots of larger plants spread throughout the grounds. "Happy Birthday" to the January kids. Recently we started a monthly Birthday bash for those celebrating birthdays in that particular month. 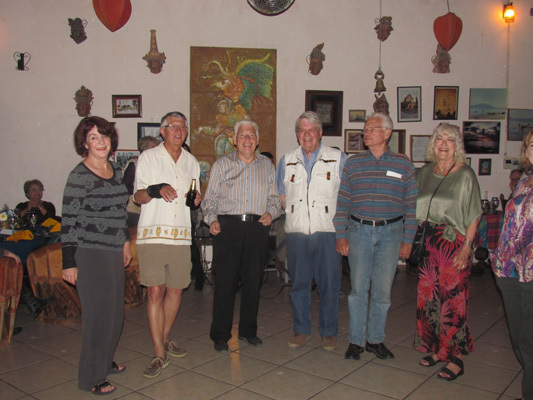 Here is Sueki, Larry, Brian, Peter, Chuck and Jean. We had five cakes and by the end of the evening, most of them disappeared. While Kay and Gary were at the birthday party, no one told Gary that we were going to have pictures taken and by the time he got back, the band started up again. So we wanted to make sure he was included--"Happy Birthday to all". Entertaining at our villa is very enjoyable. Having a pool and a hot tub is a bonus. 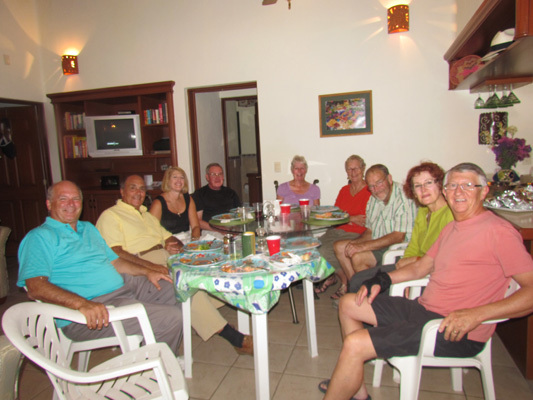 Here is Wayne, Andy and Randy, Rick and Sandy, Carol and Roger, Maureen and Larry relaxing after another one of Glorine's fine cook'n. 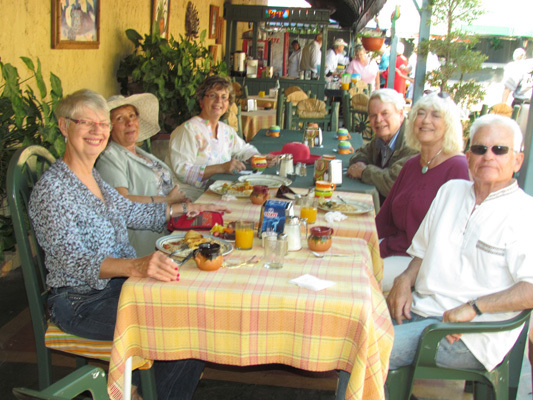 Following another Open Circle, a group of us went out to lunch which was focused on raising funds and awareness of the Tarahumara Indians, who live up in the mountains near Copper Canyon. 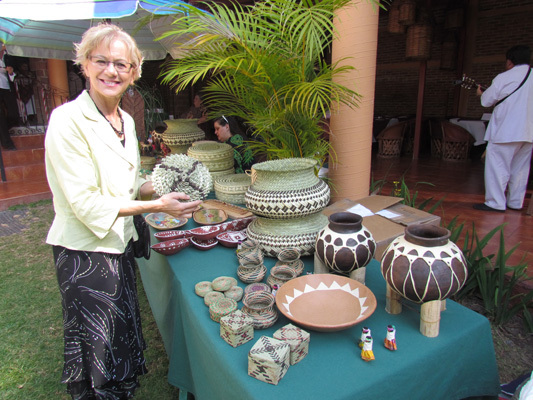 Here Glorine is holding about ten baskets, skillfully weaved from pine needles (one inside the next). 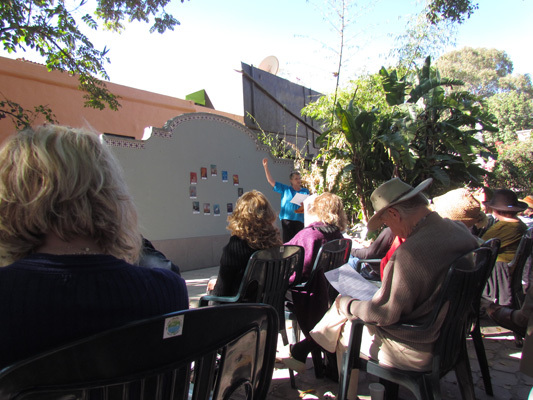 Another great outing was a tour of the Jaltapec Centro Educativo (Education Center), which has served as a residential training center for the hospitality industry for over 40 years. It is limited to 40 girls, ages 16 to 21 and includes training in all aspects of the hotel/restaurant industry. 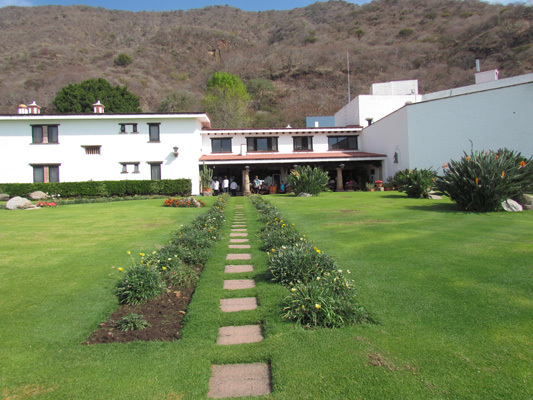 The center also serves as a Catholic retreat center, tucked away in the foothills about ten miles west of Ajijic. 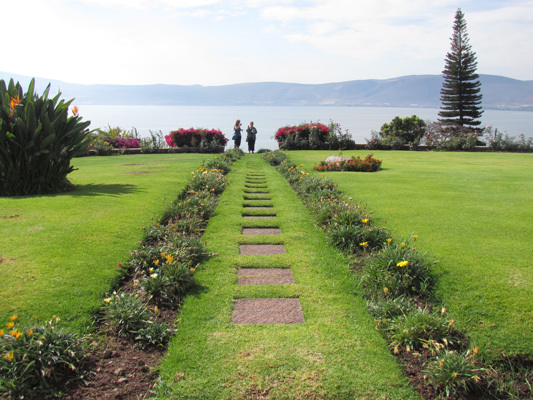 Here is a great view of Lake Chapala--wow, what a great place to have a retreat. 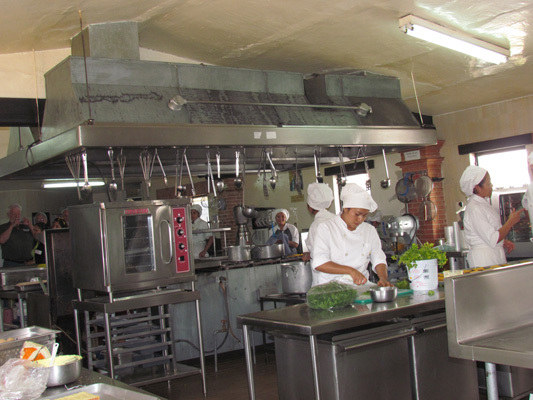 The facilities, classrooms and laboratories were well equipped and seemed to include everything needed to train students in all aspects of cooking, baking, cleaning, etc. 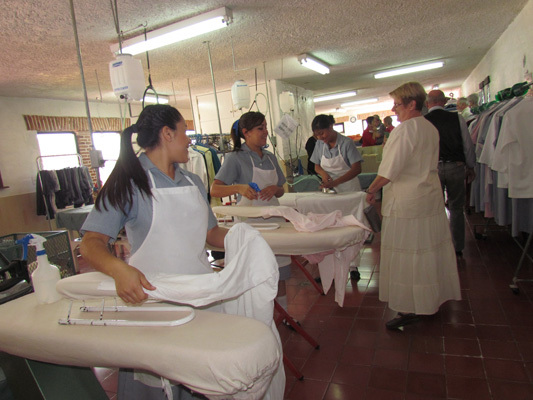 They even learned how to iron, a must when running a retreat center -- with no wrinkles! The great meal was topped off with a great desserts, prepared and served by the students. This girl is one of the 40 students that rely on scholarships money for tuition, room and board. Returning to the "scene of the crime". Here is the 12 foot wall Larry climbed over back in November. Larry climbed the tallest tree in the middle of the picture, and was able to step over the wall, stood on a ledge (the darker bricks), but the top bricks, which were newly laid, gave way and Larry lost his balance and "thud" hit the ground. The rest is history. 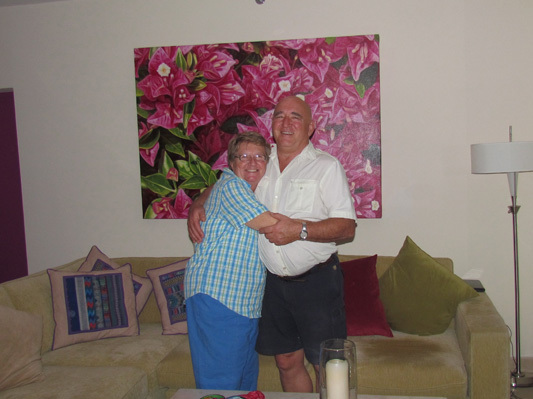 We have known these two wonderful people, Norm and Lil since we started coming to Ajijic. They had just started renting this home where Larry went "thud." 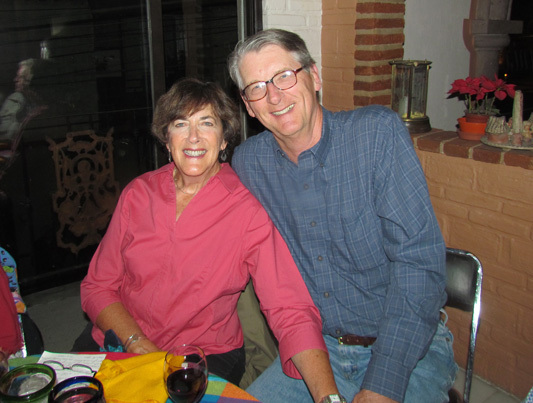 After they moved in and got their casa all decorated, they hosted at great dinner party for their appreciation. Muy Bien!! January's web page includes January 1 through January 31.